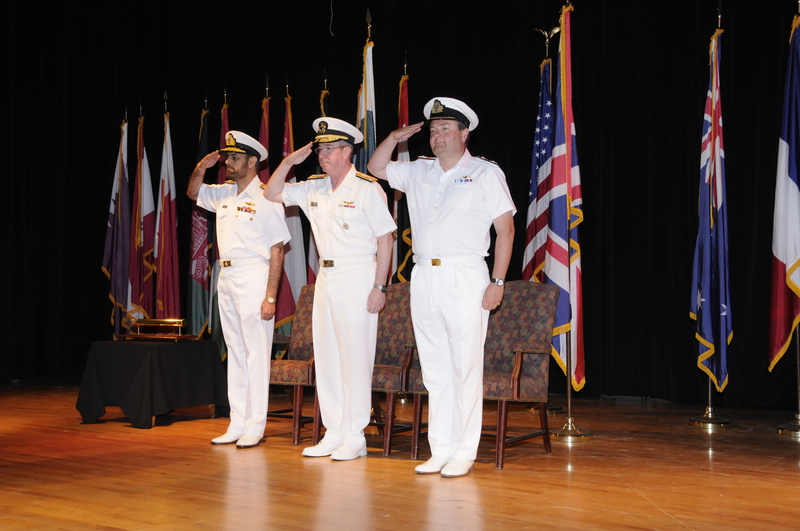 Commodore Tarrant, Royal Navy, relieved Commodore Mukhtar Khan, Pakistan Navy, as Commander Combined Task Force (CTF) 150 (maritime security), during a change of command ceremony conducted by Vice Admiral John W. Miller, Commander U.S. Naval Forces Central Command / Commander, U.S. 5th Fleet / Commander, Combined Maritime Forces at Naval Support Activity, Bahrain, August 30. The ceremony concluded the Pakistan Navy’s fifth command of CTF 150, a multi-national task force that conducts maritime security operations (MSO) in the Gulf of Aden, Gulf of Oman, Arabian Sea, Red Sea and the Indian Ocean. During Pakistan’s time in command they led a multi-national task force of ships belonging to six different nations which included Australia, Canada, France, Pakistan, UK and USA. The Change of Command ceremony marks the end of a successful period for Commodore Khan and his team which included a number of positive narcotic interceptions. On 5 May 12, HMCS CHARLOTTETOWN interdicted narcotics off Ras Fartak, Yemen and seized 500-750 kgs of hashish. On 15 May 12, HMAS MELBOURNE interdicted narcotics off Socotra islands and seized 12 X 33 kgs bags of flour suspected mixed with LSD. And finally on 1 Jun 12, USS NITZE interdicted narcotics off Masirah island and seized 1243 lbs of hashish. Admiral Miller congratulated the Command of CTF 150 by saying, “The leadership of Commodore Khan and the Pakistan Navy has reflected outstanding professionalism, dedication and true commitment to our coalition efforts and has superbly promoted international interoperability by flawlessly commanding ships of six different nationalities”. CTF 150 is one of three task forces under control of Combined Maritime Forces (CMF), based in Bahrain. CTF 150 was established to set the conditions for security and stability in the region’s maritime environment. Maritime Security Operations pressurise the maritime domain to deny international terrorists and pirates the use of the seas as a venue for attack or to transport personnel, weapons, or other material.